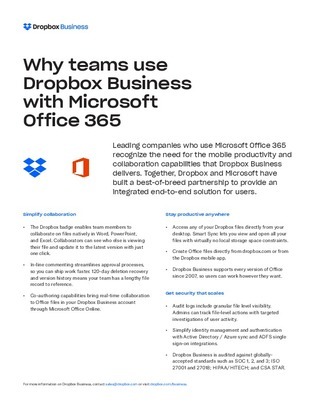 Why do companies who use Microsoft Office 365 trust Dropbox Business? In the evolving digital landscape, agility, simplicity, and mobility are the key players in an effective business strategy—which is why teams looking to simplify, scale, and stay productive have moved to Dropbox. Read now to uncover how Microsoft 365 users can benefit from Dropbox collaboration software, and streamline productivity.